The beautiful and historic city of Bratislava is the picturesque capital of Slovakia. 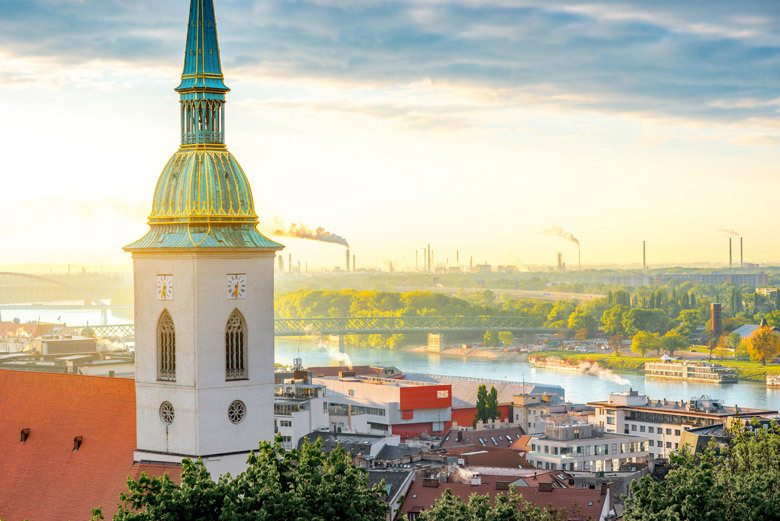 It’s the only national capital that borders two other countries, Austria and Hungary, and it’s set along the banks of two rivers: the Danube and Morava. If you visit Bratislava you will always enjoy a warm welcome from the people who live here; more than 650,000 in total. And, as you may expect from a national capital, Bratislava is the cultural, political and financial center of Slovakia. With so many things to see and do, you’ll never be short of attractions when you visit Bratislava. Full of eye catching sights to see including museums, art galleries, bustling city squares and a castle. Over the years the city and its architecture have been influenced by many different nationalities, including Czechs, Germans, Austrians and Hungarians, and it shows throughout Bratislava’s streets. As historic cities go, Bratislava boasts an incredible history – there has been a human presence in the area since 5,000 BC, during the Neolithic Age. St. Martin's church tower on the foggy morning with the industrial district in the background. Since then the place that is now a modern and thriving city has been home to many different settlers, including the Slavs who arrived during the 5th Century. The settlement later became part of the Kingdom of Hungary and the Hapsburg Empire. At that time the city was named Pressburg. During the Hapsburg period the city played an important part in Royal life; a total of eleven Hungarian kings and queens were crowned at the city’s St. Martin’s Cathedral between 1536 and 1830. When you visit Bratislava today, you can imagine yourself back in Pressburg during the reign of Queen Marie Theresa. It was during this time when the city really began to prosper and many mansions and new streets were built but when the Queen’s son, Joseph, came to the throne Bratislava’s importance declined. During the 19th Century the industry of the city began to develop and in 1918 the city became part of the newly created Czechoslovakia. The following year the city became known as Bratislava for the first time. 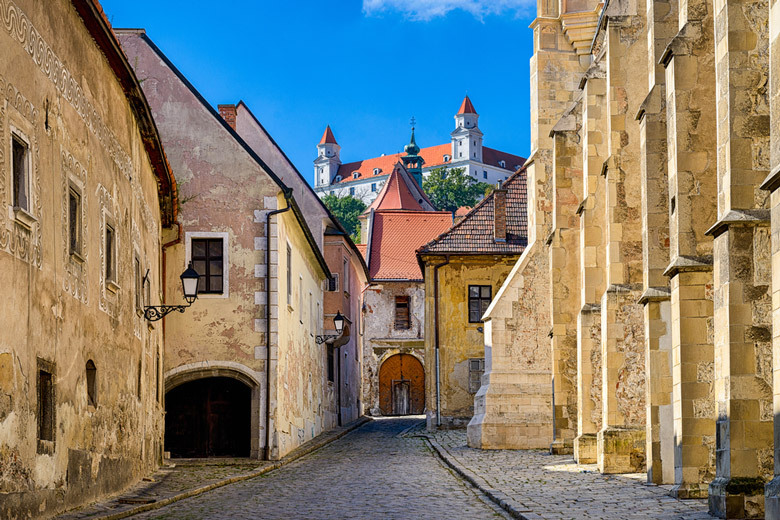 A street in Old Town with the Bratislava Castle in the background. Bratislava remained part of Czechoslovakia until 1993 when it became the capital of the new Slovak Republic. Since then the city has flourished, becoming a popular center for tourism with its beautiful surroundings and reputation for great cultural experiences. It’s the natural surroundings of the city that you will first notice when you visit Bratislava. You’re never far away from nature; the rivers, the nearby Small Carpathians and the wide expanse of vineyards. The beauty that surrounds the city is mirrored by the picturesque nature of many areas of the city itself. This includes the old town with its myriad of 18th Century buildings. This is the perfect place to start exploring when you visit Bratislava. You can stroll along the narrow streets and just relax and enjoy the history that surrounds you. If you want to take a break you have no need to worry as the area is home to an array of impressive cafes where you can seek refreshment. Do not be fooled by the old town of Bratislava though. This is also a modern and vibrant city with a multitude of things for you to see and do.